In January 2019, Healthy Workplace will be re-launching the CU Healthier Challenge! The CU Healthier Challenge is not a weight-loss challenge – it is a healthier lifestyle challenge. It’s not about trying to compete, win, or get it all perfect. This is a challenge to learn to make powerful (and often difficult) choices in the life that you lead, every day. For 6 weeks, participants will strive to make small (sometimes REALLY small), but extremely meaningful changes in their daily habits that stick – really stick. The actions taken daily in the CU Healthier Challenge help you form long-term habits that will change your life for years to come. This Challenge is designed for Carleton faculty and staff. The Challenge runs from Saturday, January 19 – Friday, March 1, 2019. Over 6 weeks, participants work towards their personal health and wellness goals in 7 categories (nutrition, exercise, stretching, water consumption, sleep, lifestyle, and reflections) and track their progress using an online tool called the Whole Life Challenge (this tool also includes a mobile app to make it very easy to track your progress on the go, throughout the day!). 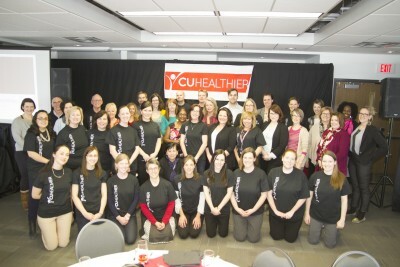 All participants create a profile on the online portal and are added on to the CU Healthier team. Using the online tool, we encourage each other to stay motivated and reach our goals! Healthy Workplace will also offer optional information sessions, workshops, and meet-ups to help participants reach their goals. Although all participants apply as individuals, we encourage you to round up your colleagues and join as a group! Below is a testimonial from Kim McWaters, Alumni and Donor Relations Officer, who participated in the challenge for the first time in January 2018. Please note: the Challenge encourages you to choose a “Nutrition Level” that you must adhere to throughout the Challenge. Participants will be guided through setting their personal nutrition goals with a dietitian. You will need to input your scores in to the online tracking tool, and begin tracking your progress on January 19th.